MARSHALL, TX — Former Crimson Tide coach, Gene Stallings, has been named the keynote speaker at the upcoming 2014 Sam B. Hall Jr. Lecture and Banquet. The event will be held on Tuesday, February 25, at 7:00 p.m. at Woods and Cornish Great Rooms on the second floor of the Ornelas Student Center at East Texas Baptist University. The lecture series program commemorates the late United States Representative and federal judge Sam B. Hall, Jr., who was a Marshall native and alumnus of the College of Marshall, which is now ETBU. Gene Stallings speaking at FCA Banquet on Oct. 23, 2012 at the Embassy Suites in Columbia, SC. “Coach Stallings is the first career coach to speak, and we have been given a wonderful opportunity to host and to hear from an exceptional man who has proven himself effective in athletics, leadership development and life, said Jerry Summers, ETBU Dean of the School of Humanities. 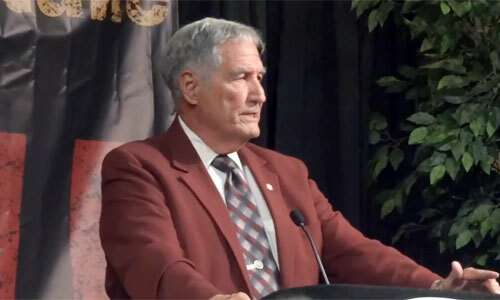 Watch video of Gene Stallings speaking at FCA Banquet on Oct. 23, 2012 at Embassy Suites in Columbia, SC. Gene Stallings played college football at Texas A&M University from 1954 to 1956, where he was one of the “Junction Boys”, and later served as the head coach at his alma mater from 1965 to 1971. He was also the head coach of the St. Louis/Phoenix Cardinals of the NFL from 1986 to 1989 and at the University of Alabama from 1990 to 1996. If you would like to book sports speakers like Gene Stallings for a speaking engagement or special event, contact Gene Stallings booking agent for appearance & speaker fees or call 1.855.303.5450.